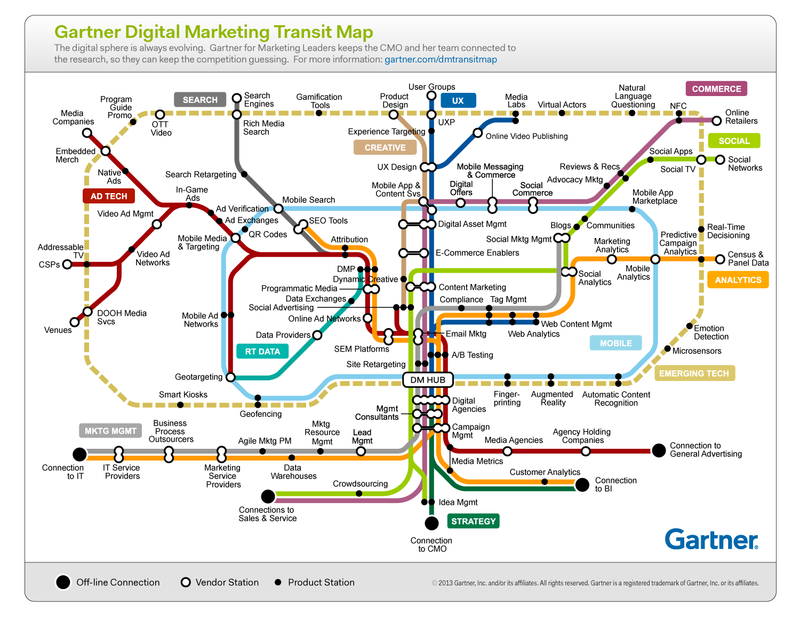 In the competition for the best visualization of the kaleidescopic marketing technology space — other entries include my marketing technology landscape from last year and the marketing technology LUMAscape from last month — I’d say Gartner has just jumped into the lead with their new digital marketing transit map. I would like to see Gartner’s recommendations on how to build this infrastructure in prioritized phases. I can see where massive enterprise marketing teams can deploy and (potentially) use many pieces of this subway map with some degree of measurable success. But not all. Where does Gartner recommend a mid-market org focus on building this transportation infrastructure? Interestingly, many orgs of all sizes are probably utilizing more pieces of these tracks than they realize. How effective they are being used is another question. How well do you feel the Social and Sales Engagement tracks are represented? For better or worse, my humble opinion is that we’re a long ways away from pat answers. I certainly agree that not every company should worry about every station in this gigantor marketechopolis — in fact most are probably best served by ruthlessly focusing on just a few of them and getting them really right. But there are clearly billions of different possible configurations to chose from. Truthfully though, I kind of think that’s a good thing. At least in this way: I’m a big believer in the power of differentiation. And since marketing is now so entwined with customer experience — the essence of the brand — it’s probably a good thing for different companies to chose configurations that best match their overall vision and strategy. 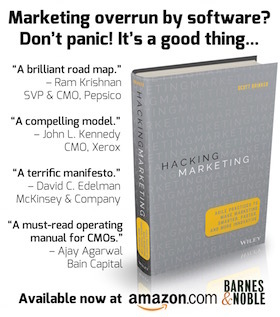 There’s no homogenized DM HUB out there, no step-by-step playbook; but that forces companies to think carefully about what’s really important and to be creative about how they entwine these capabilities into their mission. Doesn’t make it easy though! As for sales, that’s a great point. Gartner’s map ends in a “connections to sales and service” — but that does short-change some of the amazing marketing-driven capabilities that are being brought to bear on sales enablement. Maybe in their next version, they’ll extend those tracks? I like your analysis of the Transit map but do believe there are some misses. For example I think there is something missing at the intersection of social and mobile which is a very powerful space at the moment (everything my daughter does in her digital world is at this intersection). The other observation is that there is an influence the actual product and its associated commercial data has when incorporated into this model to support commerce. Perhaps this is assumed in the attribution of the product and how information is stored in the DAM. Nice to compare and contrast different visualizations like that to realize that there are many different ways to view this landscape. Thanks for sharing the other vendor transit map David. This will be fun to compare. An interesting Map, that just compounds the issues stated in the recent Accenture Report stating “Turbulence” as a key issue for CMO’s around the world in not really having a defined map in how they should interact with all the channels available to them within the digital space to achieve a sound ROI. Brian, you make a valid point that perhaps there should be more distilled versions of this that show clear paths of engagement needed to create success. Seems like a bit of a trend! All valuable resources, some more complex than others but the transit/tube analogy is well used and helps. Not all companies can have as many trains/as busy lines as they would like, but connecting the dots with something like this is very useful. It highlights the growing scale of Digital Marketing and the processes that at least need evaluating by professionals in a digital marketing role. Whilst your company may not use a large percentage, you need a grasp of what each element offers and how this impacts and connects with the others. This leaves me thinking about Einstein when he said things should be made as simple as possible and no simpler. Sorry but too complex and too pretentious.